This branch rail will make any part of your house feel closer to the "Great Outdoors" with its organic branch design. It will also enhance an outdoor stairway or balcony and can be used as a rail for trellising your favorite plants. 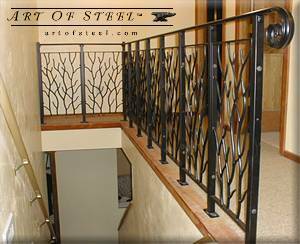 The rail system is built in sections of frames and posts to accommodate most stairwell or walkway dimensions. 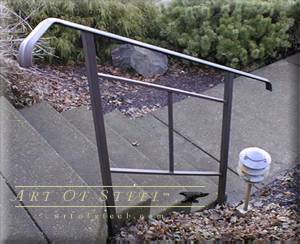 This rail will enhance any environment with its low profile design and will add protection to any elevated walkway or stairway. We have a few more designs to choose from as well as this modern design.